The Dogon inhabit the Bandiagara escarpment in Mali. 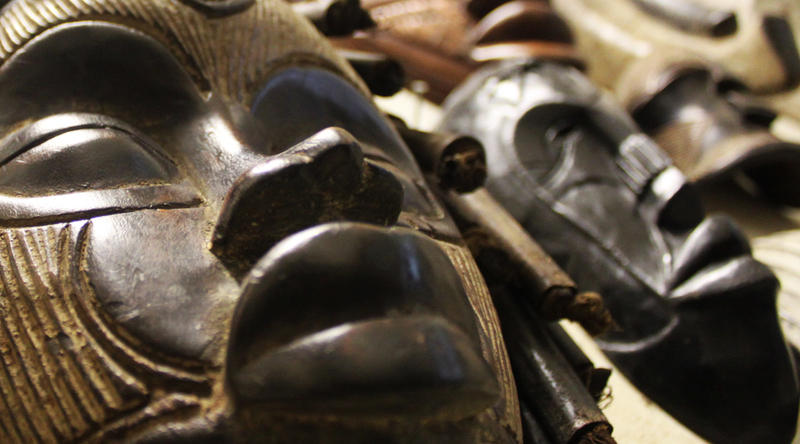 Dogon’s diverse and masterful sculpture is intimately linked with the cult of the ancestors. Figures are made to house the spirits of the deceased on the family shrine, and masks are used to drive the spirits away at the end of the mourning period. Iron staffs topped with human figures are also made, and some personal ornaments are cast in brass. Dogon social and religious organizations are closely interlinked and out of these arose four principle cults which account for richness, power and diversity of Dogon culture and art. Also found in Dogon territory are, possibly, the oldest wood sculptures to survive (three have been dated by carbon-14 to the 15th to 17th century AD). They were found in caves in the Bandiagara escarpment. The Dogon attribute them to an earlier population, the Tellem. These figures, usually of simplified and elongated form, often with hands raised, seem to be the prototype of the ancestor figures that the Dogon carve on the doors and locks of their houses and granaries; investigations have confirmed that the Tellem were ethnically a different people from the Dogon, though the art style appears to have been handed on from one people to the other.